The guide notes that the park is positioned next to a flight of steps nearby that lead up to the residential area, drawing a parallel with Suzume Park in the game. (It is also at the end of a short road, as in the game). 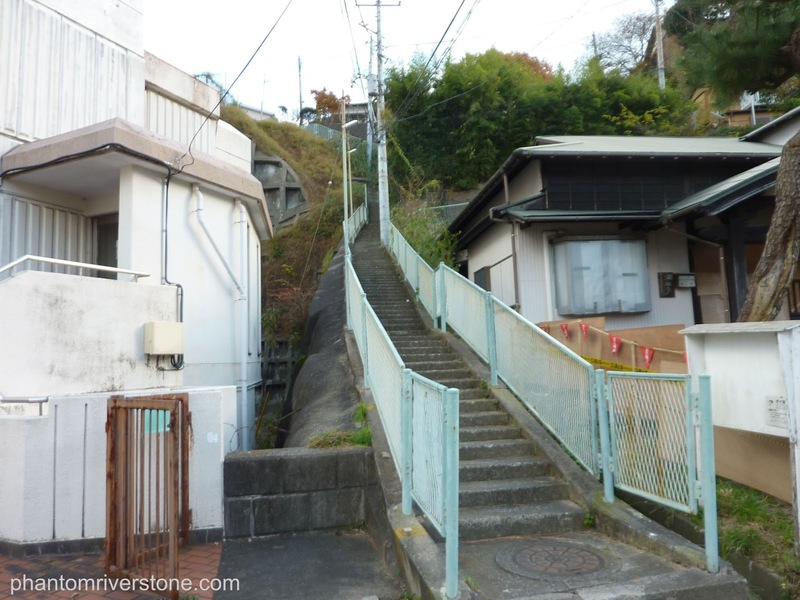 Steps near Odakicho Park which lead up to the residential area of Midorigaoka. The Inspiration for a Second Park? In fact, this park holds another secret. 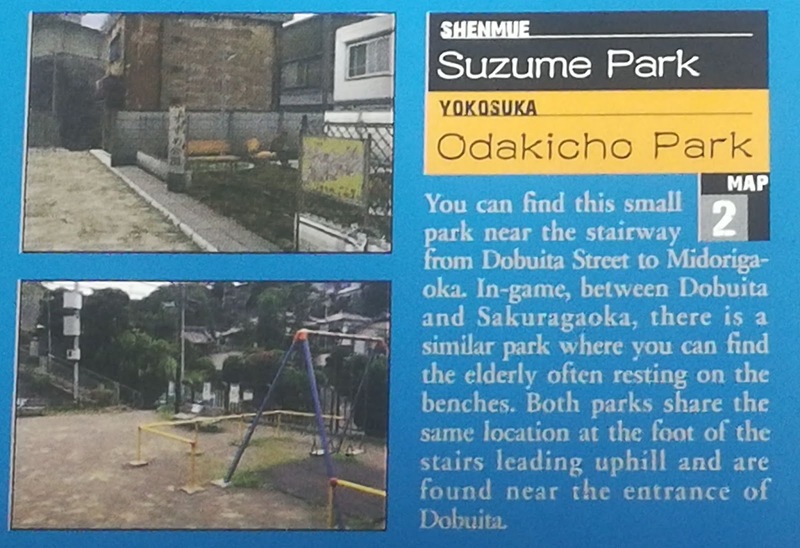 The similarities with Sakuragaoka Park (shortened to "Sakura Park" in the English version of the game) in Shenmue are striking. The style of the swing equipment in particular is almost identical, down to the low protective barrier that surrounds it. A wooden bench and slide are positioned nearby, just as in the game. 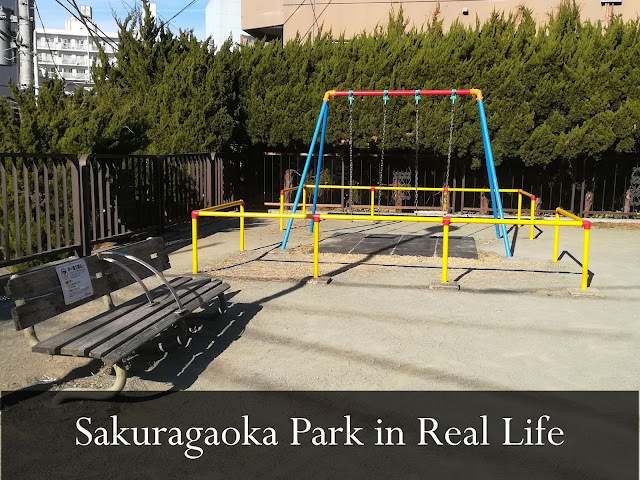 Sakuragaoka Park in the game (left) and Odakicho Park (right). The swings from the opposite side; the slide can be seen in the background in both the game & photo. The main differences are that the real-life park is more spacious than the one in the game, and it is in a different setting: where Sakuragaoka Park in the game is set up in the hills above Dobuita and surrounded by greenery, the real-life park is below in the urban district. (Oh, and both swings in the real park are in working order, unlike the one in the game where one has a broken seat). You can find Odakicho Park down the short road that has "Nozomi's" flower shop on its corner. 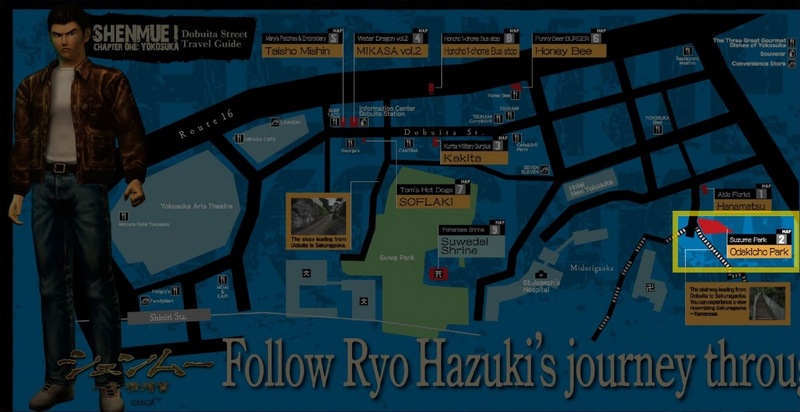 If you ever receive a message asking you to meet Nozomi at the park, now you know where to go! If you ever happen to see an elderly lady sitting on the swing looking lost, be sure to ask her if she needs any help. She could be looking for the Yamamoto's house and the guy that was supposed to be helping her has left her and gone to look for sailors. Haha, very true! That's the youth of today... er, 1986 for ya.